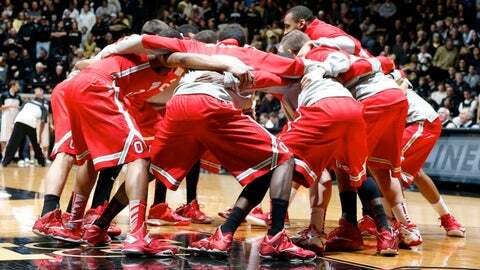 Ohio State Buckeyes huddle up before the game against the Purdue Boilermakers at Mackey Arena. WEST LAFAYETTE, Ind. (AP) — LaQuinton Ross had 25 points and 12 rebounds, both career bests, and Shannon Scott added a career-high 18 points to lead No. 3 Ohio State to a 78-69 victory Tuesday at Purdue. A.J. Hammons led Purdue (10-4, 0-1) with 18 points, 16 rebounds, five blocks and four assists in the Boilermakers’ first home loss. Ronnie Jonson added 16 points for Purdue. The Buckeyes broke a 46-46 tie with six straight points. Scott and Ross accounted for all of the points in a decisive 10-2 run. The Boilermakers did get within five in the final 90 seconds of the game. But they couldn’t any closer. It was an intriguing afternoon. For most of the first 30 minutes, neither team had more than a two-possession advantage. And in the second Ohio State, which struggled mightily against Hammons, made a concerted effort to push the ball inside early in the second half. It made an impact. When Scott hit a jumper with 16:19 to play, the Buckeyes finally had a 44-39 lead. Hammons rallied the Boilermakers again, this time getting the Buckeyes’ centers in foul trouble and capitalizing with a tip-in to tie the score at 46 with 13:58 to go. The Buckeyes answered that with a 6-0 run, followed it with the 10-2 spurt and then fended off Purdue’s late comeback bid. The first half was a topsy-turvy affair, too. Purdue took its first lead at 7-4 and didn’t trail again until Ohio State used a 6-0 run to make it 23-19 with 7:32 left in the first half. Purdue tied the score at 26 and retook the lead, 33-32, when Hammons made 1 of 2 free throws to finish a 5-0 Purdue run with 24 seconds left in the half. Aaron Craft ended the half with a nifty pass to Smith Jr., whose basket prevented Ohio State from falling into its first halftime deficit of the season. Craft finished with seven points, eight rebounds and 10 assists as the Buckeyes won their fourth in a row against the Boilermakers.